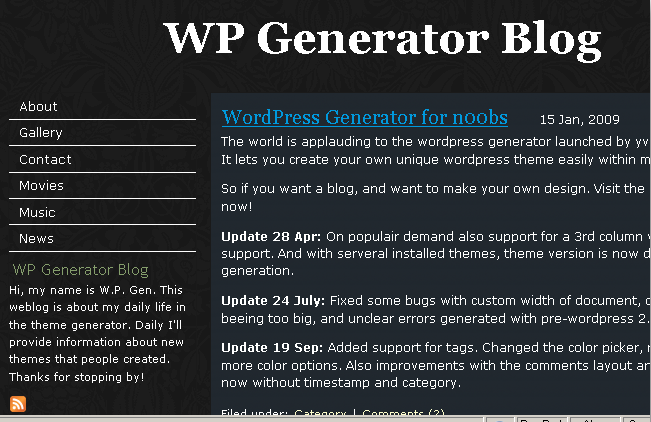 I recently started trying with the creation Blogger templates using WordPress themes . Actually the process is to extract WordPress themes and separate the CSS file used to style the theme .By doing this for some time I got interested in WordPress theming and started searching for tutorial resources . 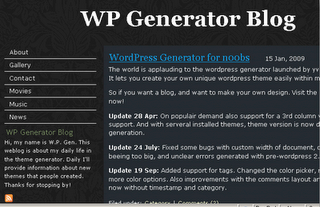 Finally my search ended up with tool used to create WordPress themes online . Here You don’t need to learn to create WordPress themes . What you need is little creative skill to organize the page colors and properties . The resulting WordPress theme can be downloaded in Zip format and ready for immediate use . These themes supports widgets and tags . They also support all major browsers and based on WordPress 2.1-2.7 and Yahoo! UI . You have a really fantastic site! Keep up the good work, I look forward to viewing much more of your posts.